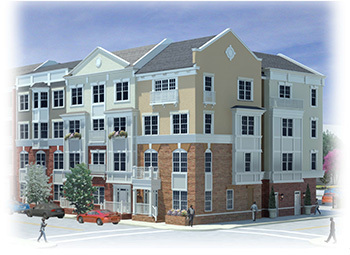 A developer obtained an interest in several adjoining properties in the hip town of Red Bank in Monmouth County, New Jersey. While the location is not the high-end of town, it is located one-half block to the train station, 2 blocks to the Count Basie Theater within walking distance of most bars, clubs restaurants. 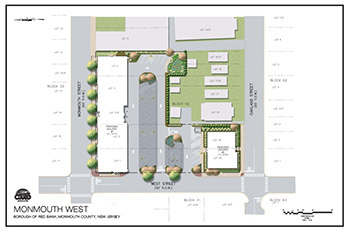 A plan for a mixed use project was developed approvals were secured for 18 condominiums (maximum allowed by zoning) over ground floor retail with structured parking. The project was never built the l was taken back by the bank that provided the financing. The condominiums were large, most being 3 bedroom units, the market for retail was suffering as the economy weakened the cost of providing “structured parking” added too much expense to the project’s cost. A quick review of the Red Bank market by Harvestate Group found that even in the dark days of the residential market there was sufficient dem for affordable, entry level product especially in a transit village location. Likewise, Red Bank was suffering from a glut of dark retail storefronts. To complicate the process further, Red bank had strict parking requirements since parking in the town was at a premium. Harvestate Group ignored local zoning codes design requirements developed a plan that was solely “market driven”. Since there was no dem for retail, retail was not included. The plan provided for 46 “European sized” 1 2 bedroom units – a mix of townhouses flats – in a building that was designed to look like a row of townhouses all fronting on one the of the site’s three street fronts. Another building of 12 units was proposed for the opposite corner of the site. Those units were to be deed-restricted to the State’s Council on Affordable Housing guidelines. While the density of the site exceeded the maximum allowable over three fold, the biggest issue was how to provide for parking. Harvestate Group proposed to bring “car sharing” (think Zip Car) to Red Bank found EZ Ride to make this happen. EZ Ride is a non-profit car sharing service owned by the New Jersey Transit Authority who, as luck would have it, wanted to develop car-sharing sites along the NJ transit shore route. A consultant was commissioned to educate town officials as to the desire of transit village residents to avoid car ownership or, alternatively in a household of more than one occupant, eliminate the need for a second car. The plan proposed 17 garages in the rear of the main building 52 surface spaces which was more than enough to meet the actual needs of the residents when coupled with 2 “car share” cars that would be dedicated not only to the development but also the neighborhood. When the project was given to Harvestate Group to fix, there were no developers willing to take it on as approved (which approval was conforming to existing codes regulations). Harvestate Group identified a strong market, assembled a team of professionals most proficient in transit village development used various planning legal arguments to compel the town to grant relief. The end result is that the bank was able to recover their investment of over $4M dollars. The project is slated to be completed by the fall of 2014.